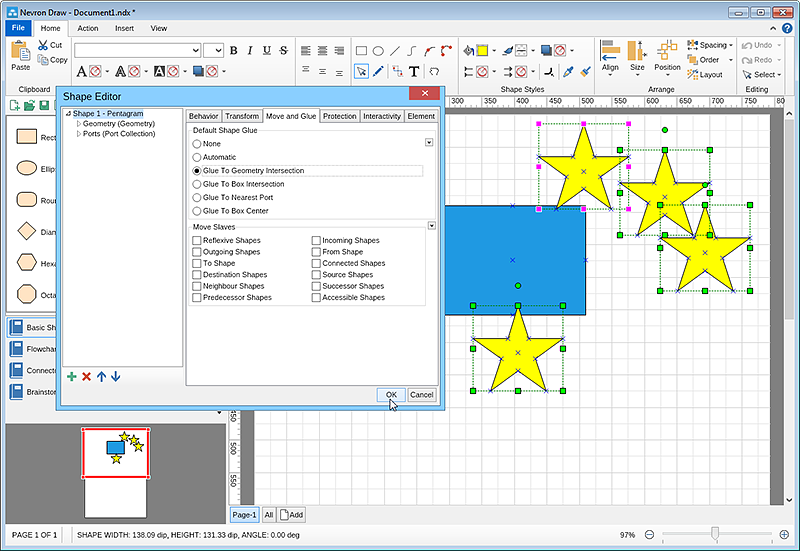 Nevron Draw comes with a large library of predefined shapes, but if none of them is suitable for your diagram, don't worry - it's easy to create a custom shape that suits your needs. 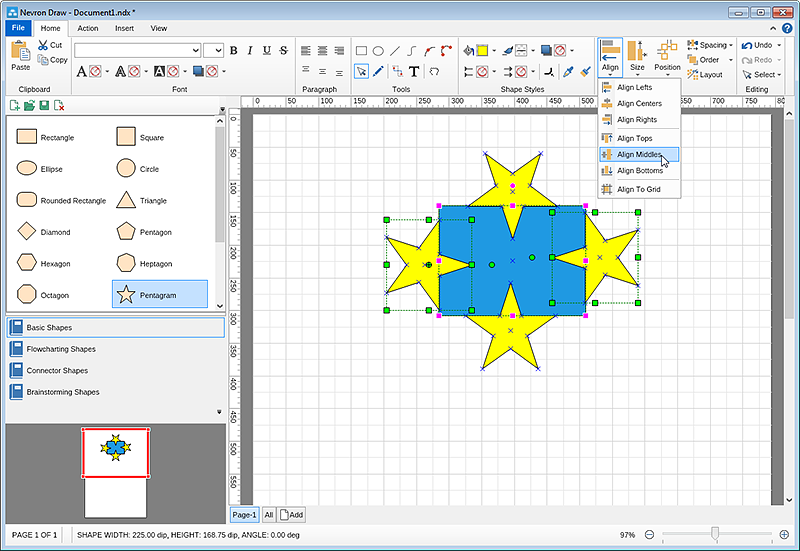 Nevron Draw provides several methods for creating custom shapes. One of the methods is through composing shapes – this means that you can choose several shapes, organize them in a way, in which when they overlap you can create the desired shape and then use any of the tools presented on the Action tab in the ribbon. Choose the shapes you would like to compose and create a new shape from. You can also add a bit of formatting to make the different shapes easier to see and work with. Use the Size tool on the ribbon to resize all shapes accordingly. Keep in mind that all the shapes are going to be re-sized based on the main shape (the one surrounded by pink squares). Select all the shapes you are will be positioning around the shape you will use as a basic one. Right click the mouse and go to “Shape Properties”. Go to the “Move and Glue” tab and thick “Glue To Geometry Intersection”. This will tell the shapes that they will be working with each other and Nevron Draw will not try to position them according to the grid. Arrange the secondary shapes according to the main one as you will later want to work with them. If you need to rotate any of the shapes, you can use the Rotate tool, where you can specify the angle of rotation. Using the "Align" tool will help you achieve the best visual result. 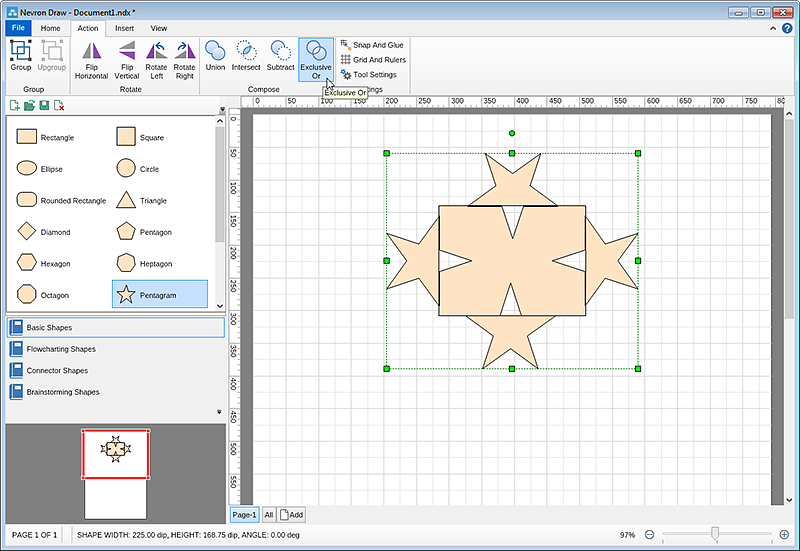 Simply select the shapes you wish to align and choose the align type from the button on the Ribbon.